and the resulting collateral damage, have been auspicious for nonfiction filmgoers outside China. Cheap, portable digital technology has seeded a flowering of uncensored documentaries about this country that sadly will remain unseen by ordinary Chinese, given scant venues and their outspoken criticism of authorities' mistreatment of minorities, victims of tragedy and artists. Shot with low budgets and under the radar of government surveillance--but not without a fair share of confrontations with authorities caught on film--these works earned San Francisco's Yerba Buena Center for the Arts' recent series title "Fearless: Independent Chinese Documentaries." This series, and many others in the US, have been happening thanks to dGenerate Films, the New York-based distributor of contemporary independent Mainland Chinese works. Outstanding documentaries make up the bulk of the company's ever-growing catalog. Many of the six works featured in "Fearless" are long. To quote a programmer's characterization of a recent overall trend in film-festival films, they "find their own length." The subjects of these works have convoluted histories that need to be told. Conventional running times don't do them sufficient justice, and the patient viewer at any rate soon finds herself deeply and rewardingly immersed. that it didn't keep. The children didn't even receive death certificates, which left them disgracefully nameless. Moreover, the middle-class parents of the dead children were subjected to firings, surveillance, ostracism, arrest and even beatings when they conducted their own investigation and petitioned for reparations. Director Xu Xin visits the victims' families on the 13th anniversary of the tragedy and records their still explosive rage and recriminations. The fourth hour of the film is devoted to the extraordinary soliloquy of one father, who comes closest to positing an overarching conspiracy theory for the tragedy. In indirect language whose import gains devastating power, he methodically indicts all the responsible parties in the incident, evoking a China that has broken down at every possible level. This is politically engaged cinema at its most appalling best--a must-see. YBCA Curator Joel Shepard reports, "Amazingly, we had zero walk-outs for Karamay." 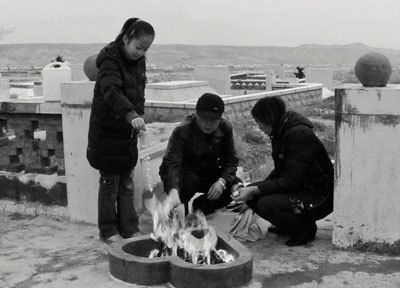 Xu was hoping to world-premiere his new film Pathway this May at the 8th (independent) Documentary Film Festival China in Beijing, but organizers cancelled the entire festival, citing "a lot of pressure," without elaborating. quietly in a church pew. The town's dwindling population shows plenty of life, nonetheless, notably in an enthralling shot of a church congregation wearing colorful knit caps singing a hymn, which rivals the pan shot of boat passengers in the opening sequence of Jia Zhang-ke's Still Life. 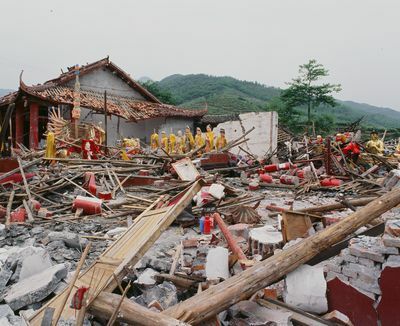 The title 1428 (Du Haibin, 2009) refers to the hour at which the 2008 Sichuan earthquake struck; this film refutes the implicit conclusion of the recent Aftershock, a melodrama bookended by the 1976 Tangshan and 2008 Sichuan temblors and China's top-grossing locally made film. In that fiction film's feel-good ending, the heroine, whose family was torn apart in the earlier quake, joins government rescue operations in Sichuan with full confidence that this time they have gotten it right. 1428 puts the lie to that complacent and dangerous attitude, as it details governmental neglect and abuse of the victims and survivors of Sichuan-first, 10 days after the quake and again, seven months later. roach found in his noodles; a man threatening to jump from a bridge and another dancing in traffic; pigs running loose on the highway; a baby found abandoned in a trash-filled lot. The overwhelming impression conveyed by this film is, again, a China in utter chaos, broken down at every level. 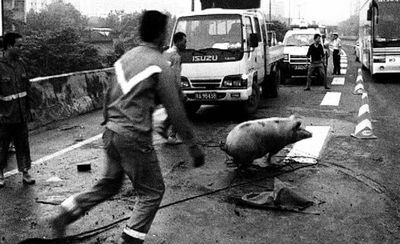 Even at their bleakest, these documentaries are a caustic tribute to the spirit of the Chinese people, for whom absurdity and disaster have become a way of life. If only they could see their lives, and their overlords, reflected in these fearless films. Frako Loden is a Berkeley-based writer who teaches ethnic studies and film history.